Sashimi - Moon over Fuji. Blade 300 mm, overall length 455 mm. The Fuji Moon Honyaki is made by using the terrific honyaki technique of only using one steel for forging. 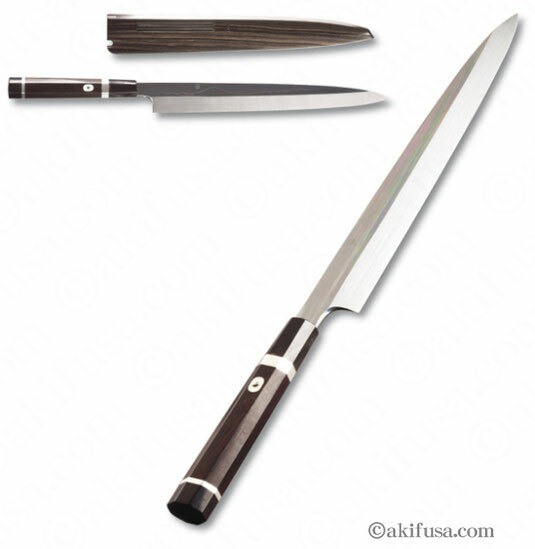 The Fuji Moon is a Sashimi knife, originally dedicated for cutting and preparing fish. Finishing: Special honyaki finishing, using a effortful heating process. The blade shows the “Moon over Fuji”. Blade: Single beveled. Makes the knife ultra sharp. Handle: Noble black ebony wood.